Having some Bob's Chocolate Flake in a Falcon with a Hunter Genoa bowl. The promised winter storm has arrived, and it's everything it was supposed to be! But I don't have to work today, and I've lots of tobacco and tea...so I'm feeling pretty pleased with myself. I'm working the Bosun/Falcon/Yorkshire tea combo pretty hard right now. Next up. SG FVF 2010 in a Castello Great Line Fancy Bent Billiard. More black Nespresso on the side. I love this picture of Glenn Ford! Good day, gents. I'm smoking C&D Bluegrass in the Custombilt Standard pot. Condor RR in a Meerschaum Falcon pipe, I'm watching YTPC video's, with a tankard of Guinness on the table. Lunch time here. After a light lunch I'm having some Father Dempsey in a half bent Cayuga. Dunhill Flake in a JnJ Billiard for lunch today. Samuel Gawith Navy flake in a no name bull moose. Evening all. Lonesome Llama in a cob. Fat Tire to pair. Second bowl of Classic Burley Kake in my little Bewlay. This stuff really flips my turtle. I hope you all are having a lovely Tuesday! That's a sweet little pipe! A late start to my day. St Bruno Flake vintage 1997 in a Kaywoodie 8822 Aged Bruyere Carburetor Billiard. Nespresso Stormio black coffee is my drink. Hot dog! I’ve heard that old St. Bruno is the bees knees! I’ve tried some very old Ogden’s St. Bruno RR but unfortunately it didn’t fair too well over the years and all of the beautiful topping had dissipated but the underlying tobacco’s were quite good, reminded me a lot of GH&Co’s Dark Birds Eye. The Ogden’s RR was more of a shag cut than today’s (Mac Baren’s) St. Bruno RR. Getting ready to light up a bowl of Sutliff Elizabethan Match in a Castello Straight Apple. Pic from earlier. 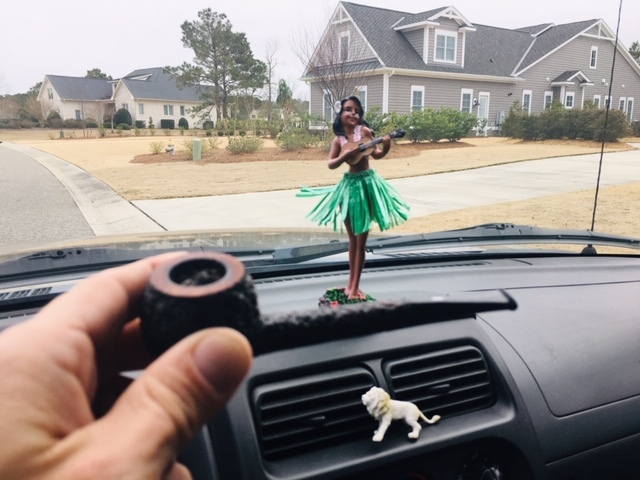 Dashboard Hula Girl Approved!! Next up. View attachment 24329 View attachment 24330 SG FVF 2010 in a Castello Great Line Fancy Bent Billiard. More black Nespresso on the side. I love this picture of Glenn Ford! Wow! Thanks for sharing! Love that picture. I’ve been lucky to have scored a few tins from eBay through the years, not nearly enough though. It is fabulous. I don’t like the new iteration of it. Not enough fragrance or strength. I'm smoking Dark Flake in a John Brumfit Rhodesian Snuffing GH&Co Kendal Brown and drinking a couple of pints of Yuengling Traditional Lager.